While you may be familiar with the basic hand sewing needle that comes in every sewing kit, there are actually several different types and sizes of needles to choose from. Depending on the type of hand sewing you'll be doing, there's a needle that's perfect for your task. You can buy needles at any craft store, and specialty sewing stores like JoAnn Fabrics will have a great selection to choose from. Books of multi-sized needles are affordable, often less than six dollars apiece, and they give you plenty of options for almost any project. Create4Less offers a wide selection of sewing needles for every project. Amazon.com offers hand needles from a variety of manufacturers. While early sewing needles were crudely constructed from wood or bone, today's needles are usually made of steel and plated with nickel, titanium, gold, or platinum. 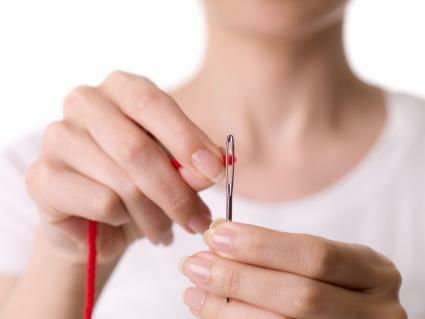 Needles vary in size and shape, but most hand sewing models have a pointed end and a hollow loop or eye. To use the needle, you insert the thread into the eye and push the pointed end into the fabric. Some designs have a slot in the needle's eye or near the eye to make threading easier. The best hand needle for your project will depend on the type of sewing you're doing, the thickness and density of the material you're using, and the effect you're hoping to achieve. There are several needle types that are popular with seamstresses. When you buy a book of needles, it will almost always contain sharps in various sizes. These are the needles you will use for most general sewing. Sharps have a rounded eye, a sharp point, and are medium length. The thinnest sharps are very slender, perfect for delicate fabrics like chiffon or silk, while the thicker sharps can work for heavier jobs like canvas or denim. Shorter than sharps, betweens are small needles that work well for quilting and finish work. They are designed to create tiny holes and carry thread through thick fabrics. If you are quilting or doing heirloom sewing, or if you're altering clothing, betweens may be the best needles for your project. If you make hats or create fabric flowers and embellishments for your projects, you may find that milliners' needles are useful. These long, thin needles allow you to take several stitches onto the needle at a time. This can help when you're basting or if you need to create simple gathers in fabric. If you do hand embroidery or if you like to add embroidered embellishments to your sewing projects, embroidery needles should be part of your sewing kit. Thicker and longer than other needles, they also have a large eye to accommodate multiple strands of embroidery floss. One great way to add something extra to your sewing projects is to embellish them with beads. If you work with small-holed beads, beading needles are essential. These long, slender needles have very narrow eyes which allow them to pass through the center holes of small beads. Although they are not usually included in standard needle books, upholstery needles can be handy to have around. These long needles are sometimes curved, and they work well for getting into odd spots on heavy-duty sewing projects. If you do upholstery work or tie quilts and coverlets, you may want to add some of these needles to your supply kit. Ballpoints look like sharps, but they have rounded tips. If you're sewing with knit fabrics you may find that a ballpoint needle better serves your needs. Darning needles have blunt tips and large eyes and come in many sizes. If you're repairing a hole in a knit item, a darning needle will come in handy. Tapestry needles are long, blunt-tipped needles. If you're sewing on loosely woven, thick fabric, a tapestry needle is best. Bodkins are very large, blunt needles, and you can use them to thread drawstrings or elastic through a fabric casing. In general, your sewing needles won't require much care. Keep them dry to prevent corrosion, and if they become dull, sharpen them using a small pincushion filled with sand, called a needle sharpener. With proper care a book of needles can last for several years.